Hello, my name is Todd, and I am alive. That's right, I am a sentient being trapped inside this plushie body. When I was a young Poogle, blue in color, I carelessly wandered away from my owner and was dragged into the laboratory of a mad Skeith scientist. I still do not know the mad scientist's name, but he knew mine. He also knew where I'd lived, and where my owner was at all times. Because he'd been watching us for a while before approaching. This mad scientist and his mad contraption zapped me until I became Plushie...because, apparently, that's what he does. When times get hard due to expensive research and development costs, he nabs careless Neopets that wander past from nearby, takes them to his lab, and zaps them. 'What happens then?' You're probably very curious. But you need not be, because his plan for us actually wasn't very interesting. In hindsight, it was rather obvious. By simply passing us off as plushies, he was able to sell us as inventory to various shops. But since we never thought that far, what with having been so disoriented and fearful due to the sudden change in circumstances, we also never saw it coming. So his ruse worked well overall. ...Well, at least on most of us. Before I was shelved, a Red Wocky named Stan kept screaming at all of us, telling us that the laboratory was a place of bright lights and loud noises. Although he seemed to believe we would be teleported to Kreludor by Alien Aishas, I knew in the pit of my stomach that he wasn't entirely crazy. I found out firsthand that his description of 'bright lights and loud noises' was apt. The Lab Ray was an ugly contraption that possessed a beam that was far too bright and beeps that were far too loud. I still don't even know how many days I was trapped in the laboratory along with the other kenneled Neopets. When I wasn't living like a Kadoatie, I was being forcibly made to stand under the beam of the Ray until my captors were satisfied with the results. We were zapped each day, in the same order, at the same time, like clockwork. The mad Skeith had many helpers whose job was to ensure that we were zapped the appropriate color and sent to the appropriate place. At that time, we didn't know what that place would be. However, just as sudden as our capture was our expulsion. I woke up in a storeroom at night. I was not alone in the batch. We, the sentient, living Neopets, were placed on high shelves next to the glassy eyed, neocotton stuffed, molded plastic adorned, real Poogle plushies. It was terrifying. Alone, in the dark, teetering on the edge next to inanimate objects that resembled our likeness so closely. Some of my comrades screamed and made a fuss. Others attempted to jump off of the shelf and run for safety, but in the unfamiliar setting, on unstable legs of velveteen material, they didn't get far and were forced to simply lay there. In the morning, we were able to see how we'd arrived. Neopets of flesh and blood, workers of the shop, began pulling more plushies from cardboard boxes. It wasn't long before too much inventory accumulated and we were moved to the display shelves. I watched my comrades get sold and soon came to know what I had to do. I wasn't yet malevolent, you see. I was just a normal plushie Poogle pretending to be a Poogle plushie. But upon seeing me smile, the children shrank back in fear and galloped, flew, or slithered away quickly. In the daylight, we pretended to be just like our inanimate counterparts, but at night, we began to plot our escape. Perhaps, that is when the malevolence grew within us. The more we plotted, the longer we stayed, the more we began to see that we'd been given an opportunity. What we would choose to do next was obvious. We would free the isolated, sentient, plushie Neopets who'd been sold before us. But to do this, to find them and rescue them from the monotony of shelf life, we would need more comrades. It was obvious that we would need to start our own laboratory to make more Plushie Poogles like ourselves. Our smiles had grown eerie and our eyes, red. We could easily distinguish ourselves from others as a result. As sentient plushies, we could also easily go undetected doing just about anything. Whether we were infiltrating, hiding, or escaping, our velveteen bodies were an undisputed asset. So in the darkness of our boxes, store room shelves, and display cases, we came to realize that we didn't want to escape the toy store in order to live normal lives again. We would escape and infiltrate the world beyond. Without anyone knowing, without anyone stopping us. We'd turn them all before they knew it. We put our plan into action rather spontaneously, during the night of the Halloween sale. Hundreds of us leaping from our shelves and flinging our soft plushie bodies onto the unsuspecting faces of workers and customers alike. Chaos ensued as a stampede broke out for the exists - but we'd already blocked them and were prepared. Our voices rang out in unison, our grins unsettling, and eyes glowing red in the dim lighting of the creepily decorated store. "The sale is over! Instead, we will go with you for free!" A quick scan of their expressions, along with the mass panic, made plain to us the fact that not many liked the idea. Children cried and clinged to their equally perturbed parents as we encircled and swarmed, climbing up their lower limbs, ascending their backs, and laughing manically. They had no choice but to take us with them. If they tried to escape us, we merely climbed into their bags, grasped their legs, and tripped them on our backs. Even though our bodies were those of mere plushies, our tenacity was akin to a horde of zombies. As we made our way out of the shop, Neopets screamed and ran into the busy streets. They thought that they could perhaps lose us in the Halloween parade. But my sentient comrades were everywhere in sight. If they lost their initial target, they found a new one. I was held tightly and brandished like a weapon to ward them all off. The street had yet to collapse into confusion, only because it was Halloween and most Neopets were convinced that it was some form of entertainment. They would soon find out that that was not the case. I knew it just by seeing the sheer look of terror on the children's faces as plushies sprung from the toy store or climbed through the glass that frightened customers had thrown heavy objects through in order to leave. And I was right; they learned their lesson well. That year, just last year, in fact, the Defenders of Neopia got involved and began to track down and subdue what they termed Neopets suffering from MSPP Syndrome. We were determined to have been victims of a mad Skeith still at large. For many of my comrades, that day was their last. Most were repainted or morphed, and resocialized....I never saw them again. 'Ah, but wait- what happened to you?' You must be wondering. The answer is simple. I was never caught. Like the mad scientist Skeith who did this to me, the Defenders of Neopia have yet to find me. '...' You must be thinking in silence that it is strange for me to tell you my story so candidly. In fact. You must be wondering when you encountered me at all...you don't really remember having had any Poogle plushies in the first place, much less on your windowsill. Yes, you must be feeling quite unsettled. Because, you see, I haven't given up on the opportunity this plushie existence has given me. And I quite miss those nights, plotting in the dark with my comrades. And I've been watching you from your windowsill since I crawled in through the window just last week. an interest in my ideas too. That's why I'm here, actually. While I distracted you with my story, the horde has arrived. It's Halloween again, you see. And he's outside right now. Along with a few hundred of my friends. Waiting to take you too. No, don't run. We're outside of that door too. 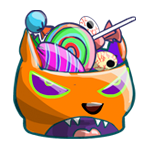 It’s Halloween so that means it’s time for trick-or-treating! But before you do it’s a smart idea to plan your route and know exactly where you’re going ahead of time, that way you don’t get lost and can get the most candy as possible. And also so you know who NOT to go to. It's been a long year- she deserves it. She knew they were getting close when the tangle of trees became too much to fly through. According to one of the now lost books in Faerieland’s enormous library, the forest that contained the Haunted Woods was too dense for anyone--even Queen Fyora the book claimed, although Misquote doubted that—to spot it while flying. The Spookiest Aspects Of Neopets! 'Tis the season of tricks and treats, and I hope your Halloween celebrations are going well! *munches candy corn* That said, in honor of the holiday, I thought I'd write an article all about the spookiest aspects of Neopets! To compile this list, I scoured the Neoboards for the opinions of my fellow players.